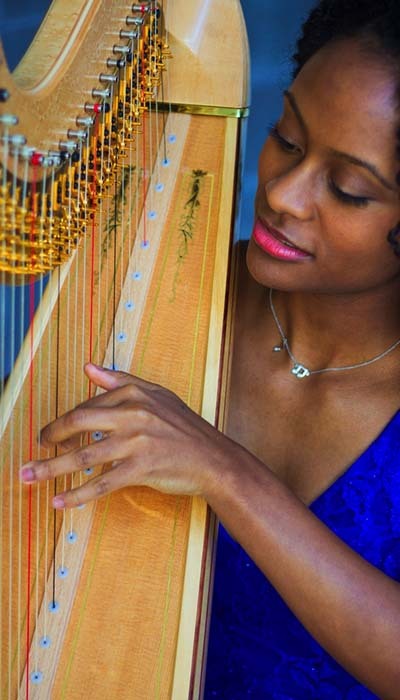 Angelica Hairston knows how to make a harp sing. You may have first heard her work her magic when she performed on NPR’s From the Top with Host Christopher O’Riley Show 228 in Athens, Georgia, at age 17. Now, at 23, she continues to play her harp as a soloist and as a chamber musician. Her journey also involves a big challenge – one she is up for – helping young African Americans break the color barrier in classical music. Angelica first began playing the violin when she was 4, but she later told her parents that she wanted to try the harp because it was just so beautiful. Her parents proposed a two month rule, and thought surely she’d give it up after that time. They were wrong – she loved it. Her dad, a band director, would say, “Just put a little Angelica in it,” always advising her to feel the music deep inside. Throughout high school Angelica was part of the Atlanta Symphony Orchestra Talent Development Program, which assists young African American and Latino music students, offering them extensive financial and moral support. They assisted Angelica by providing the finances for lessons and music camp, and helped her to purchase her own harp. As part of the Talent Development Program in Atlanta, Angelica was able to attend Boston University Tanglewood Institute (BUTI) for two summers, where she studied with renowned harpist Ann Hobson Pilot. Ms. Pilot’s 28-year tenure as principal harpist in the Boston Symphony Orchestra is a groundbreaking achievement for an African American woman. After high school in Atlanta, Angelica did undergraduate work with Judy Loman at the Glenn Gould School of the Royal Conservatory in Toronto. While studying in Canada, Angelica noticed that she didn’t see many African Americans on orchestral stages or represented in classical music audiences. Less that 1% of compositions performed by US orchestras are by composers of color. She found the Master of Music Industry Leadership Program, a one-year intensive program located in Boston at Northeastern University. “You might say we learn about musical non-profits from A to Z. We learn about management, finance, music organizations, marketing, legal issues, and strategic planning in the music industry.” she explains. Angelica was also chosen as the 2015 recipient of the Dr. Martin Luther King, Jr. Graduate Fellowship at Northeastern, administered by the John D. O’Bryant African American Institute. She is now planning a celebration concert called “Challenge the Stats” featuring African American musicians, filmmakers, dancers, and composers. For Boston readers, join us for this important concert on Sunday, April 17, 2016 at 7:30 PM at Northeastern’s Fenway Center located at 77 St. Stephens St. In an effort to get people talking about the industry and about tangible ways to make an impact for young African Americans, she is also hosting a Twitter Chat (#ChallengeTheStats) on April 4 at 7:30 PM EST, that aims to bring forth ideas and suggestions for increasing diversity in the arts. To learn more about Angelica and hear her on Show 228, click here. Also, visit her website.